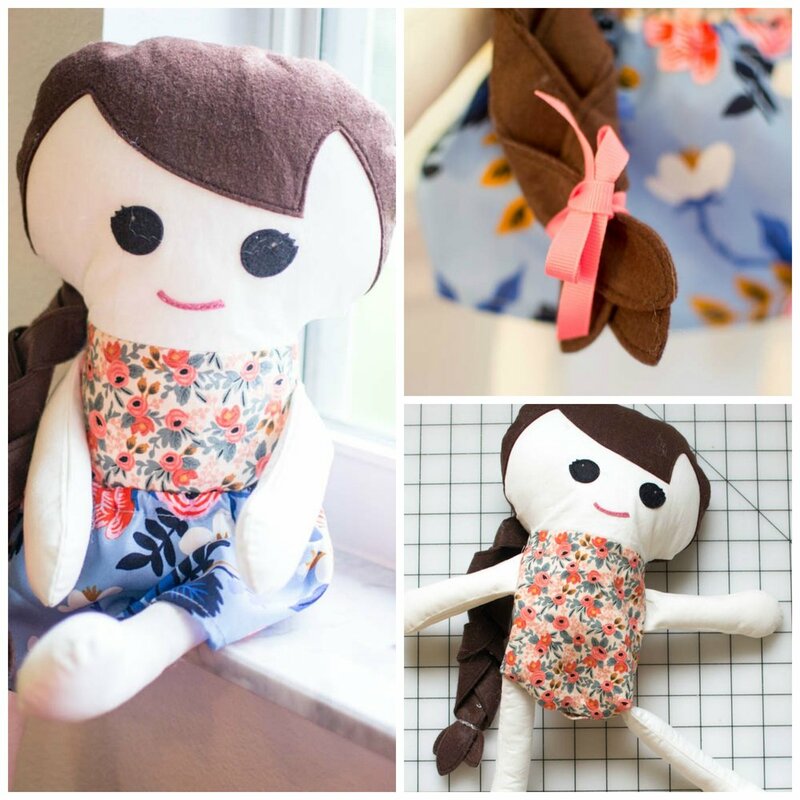 Adorable Free Fabric Doll Pattern - Meet Katy! I remember the first fabric doll I owned - my mom didn't sew it for me, but it came from one of her friends who also sewed. Thinking back, I bet my mom bartered babysitting or canned peaches to get me that doll. She had yellow yarn hair and an eyelet nightgown, oh the 80's! When I designed this Katy doll, I had one of my friend's daughters in mind. She has beautiful, unruly, curly, dark hair that they try to keep braided almost all the time! 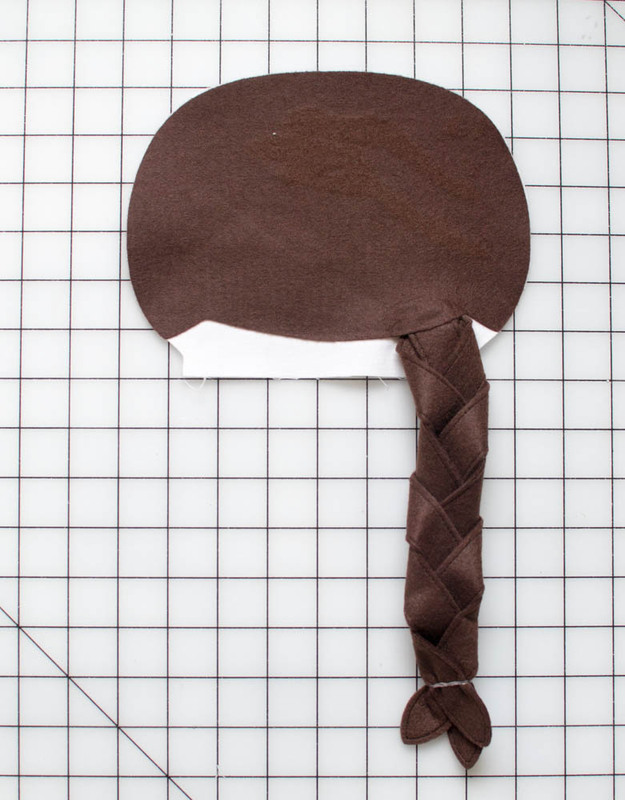 So I thought it would be fun to come up with a fabric doll pattern that lets little girls braid the doll's hair. So that's what I did. Katy's hair is made of felt and it has 3 long braid-able strands. 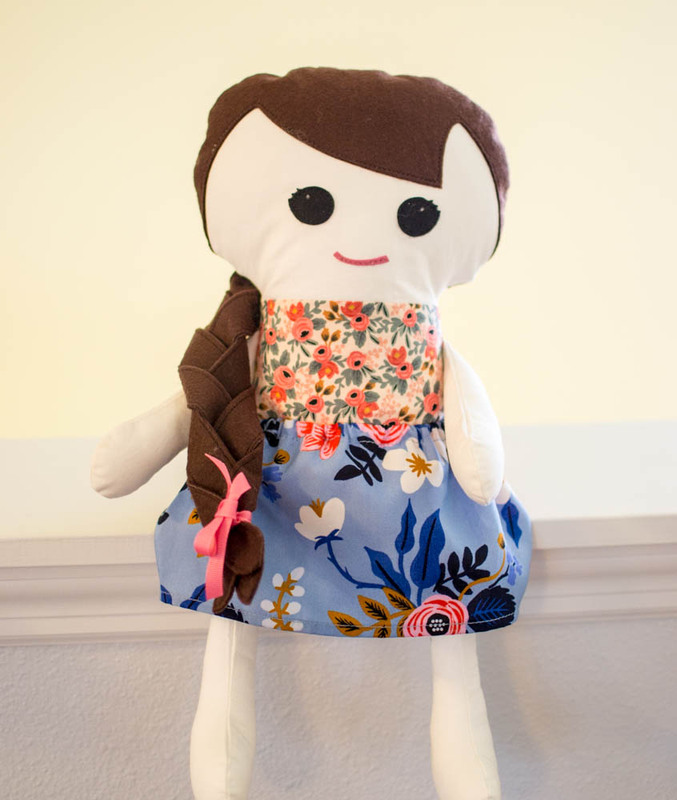 Katy’s body can be sewn with the same color of fabric as the face, arms, and legs (she will be naked) or with a print fabric to coordinate with the skirt (see how to make a doll skirt). Finished dimensions: approximately 17’’ tall, 11 1/2’’ around the waist. 1. Cut out the paper pattern pieces for the body, head, arms, and legs on pages 8-10 here. 2. 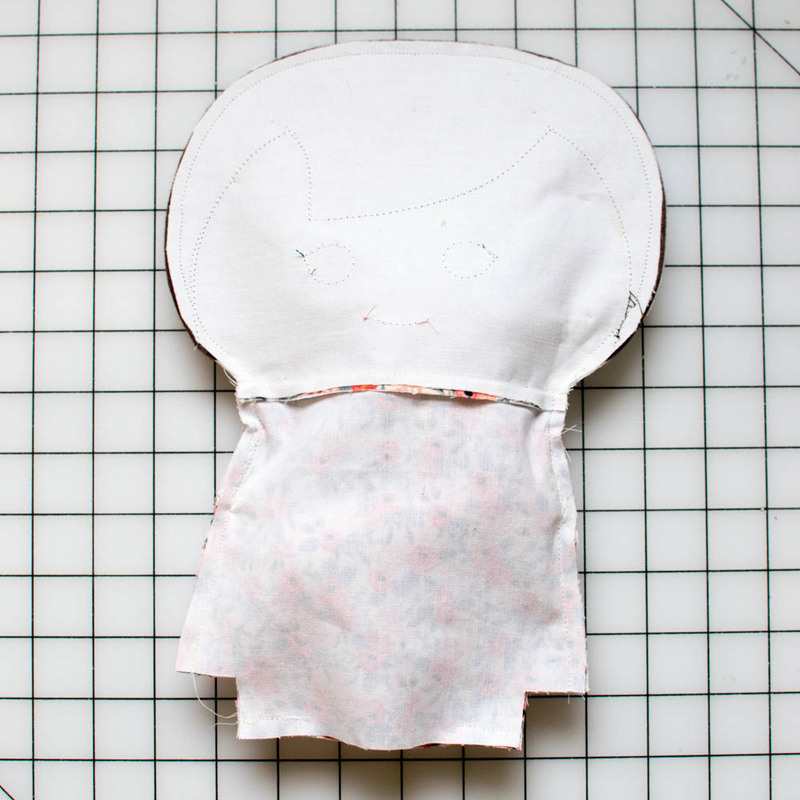 Cut and apply fusible interfacing to the body, head, arm, and leg pieces. Tip: Fusible woven interfacing on the body pieces helps to keep the surfaces of the doll smooth, even if your poly-fil gets lumpy. 1. The face and hair templates are found on pages 11-12 here. Cut out the template for the long strip of hair (in 2 pieces) and tape it together to make a pattern almost 11 1/2’’ long. The other templates can be traced without cutting them out. Cut around these shapes with at least 1/4’’ extra around each one. 3. Fuse the traced eyes to the black felt, the mouth to the pink felt, and the hair pieces to the brown felt. Cut each felt shape out along the tracing lines before removing the paper backing on the fusible web. Use a craft knife to cut out the small ‘sparkle’ in Katy’s eyes (optional). 4. Arrange the eyes, mouth, and front hair on one of the head pieces. Press to fuse. Using thread that matches each felt piece, stitch around the eyes, mouth, and the lower edges of the hair to secure. 4. Place the long hair strips in sets of 2 with the fusible sides together. Press each set to fuse so you have 3 double-thickness strips. Stitch around each piece close to the edges. 5. Stack the 3 braid pieces with the long ends pointing downward to the right, left, and center. The center piece should be on top. Stitch across the top of the pieces to secure them. Braid the three strips of hair loosely. Secure the braid with a small elastic band at the bottom. Tip: fold each strip over toward the center as you braid it for a prettier braid. 6. Arrange the back hair piece and the braid on top of the remaining head piece. The braid should be under the back hair by about 3/8’’ and can be in the center or to the side, as long as it is at least 1’’ away from the side edge of the head. Press to fuse. 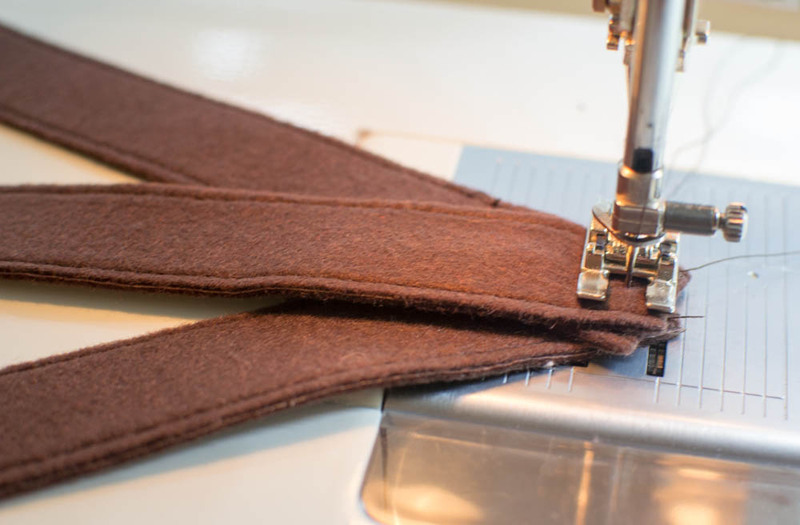 Move the back head piece to the sewing machine and stitch along the lower edge of the back hair piece to secure it in place as well as the braid. 6. Pin each head front and back to a body piece right sides together and stitch with a 1/4'' seam allowance. Press the seams toward the body. 1. Pin the arm and leg pieces in sets right sides together and stitch around each set leaving the top straight edge open. Clip notches around the curved edges or trim with pinking shears. 2. Turn each arm and leg piece right side out. Stuff lightly with polyester fiberfill. Baste the top edges together. 3. Pin the arms to the right side of a body piece, 1/2’’ below the neck seam. Baste in place a scant 1/4’’ from the edge. 1. Place the doll front and back pieces right sides together and carefully pin all around the head and body, making sure to keep the braid and arms toward the center and away from the seams. Sew around the doll body and head starting with the body side seam and ending at the body side seam on the opposite side. Do not sew the square cut-out at the bottom of the body. You will sew the bottom edge, leaving an opening, in the next step. 2. At the bottom of the doll body, stitch along the bottom straight edge for only 1’’ from either side, leaving an opening at the bottom of the body. Clip notches around the curved head or trim with pinking shears. Clip to the stitching at the top of the neck. Press the raw edges at the bottom opening back 1/4’’. 3. Carefully turn the doll right side out by gently pulling it through the opening at the bottom. Stuff the head firmly with polyester fiberfill. 2. Tuck the end of one of the legs inside the seam. Make sure the foot is pointed toward the front. Pull this seam out through the bottom opening just enough to pin and sew it. Stitch. Repeat for the other leg. 1. Stuff the neck and body with polyester fiberfill. Stuff the neck portion firmly so the head won’t be floppy. 2. Hand sew the opening closed. Tie the ribbon around the braid end. Learn how to sew the little skirt that goes with this fabric doll pattern in my post How to Sew a Doll Skirt! 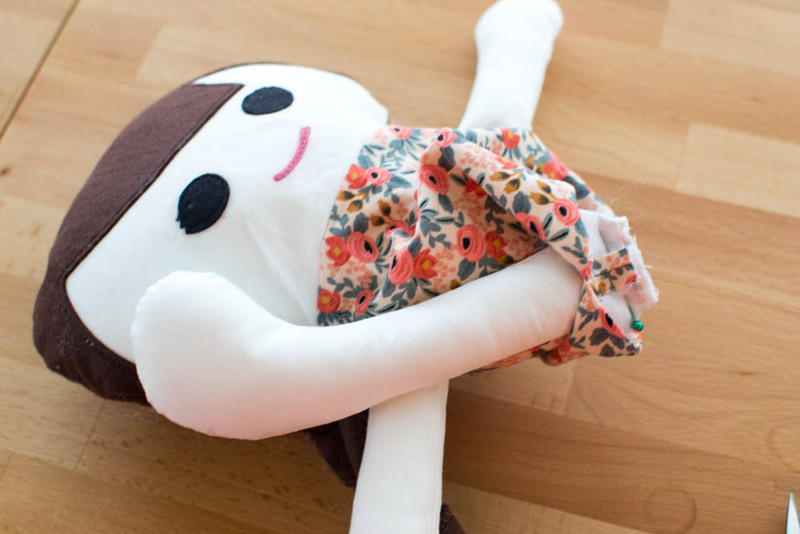 If you sew a handmade doll using my free pattern, please post about it and tag @sewcanshe so I will see. And make sure you check out all my other free sewing patterns too!